Tickets on sale NOW, ticketmaster.com, The Wharf Box Office and Charge By Phone 800-745-3000. Contest Period. The Contest will begin at 3:00 p.m. CT on Monday, March 18, 2019 and will run through 5:00 p.m., CT on Friday, March 22, 2019 (the “Contest Period”). The Station’s computer is the official time keeping device for this Contest. On-Air: Listen to the Station weekdays from 3:00 p.m. to 5:00 p.m. CT during the Contest Period. During the 3 p.m. hour when the Station announces the “Sunset Repeat Tour” Cue to Call, listeners should call the Station at 850-244-1055. 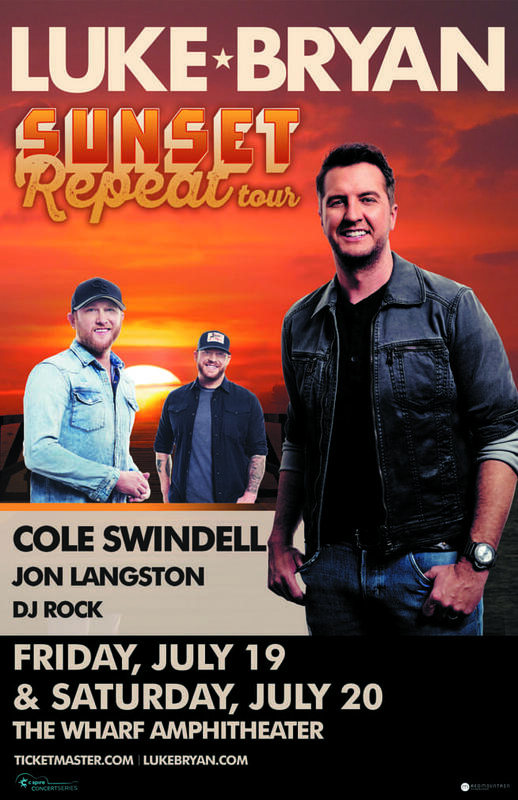 Caller five (#5) to the Station, as determined by the Station in its sole discretion, will win tickets to the Luke Bryan concert for the show on Friday, July 19, 2019. During the 4 p.m. hour when the Station announces the “Sunset Repeat Tour” Cue to Call, listeners should call the Station at 850-244-1055. Caller five (#5) to the Station, as determined by the Station in its sole discretion, will win tickets to the Luke Bryan concert for the show on Saturday, July 20, 2019. Time Delay Between Over-the-Air Analog Signal and Internet Broadcast: Due to the time delay that exists between the Station’s analog over-the-air signal and the Station’s online webcast, listeners who listen to the Station online may hear the cue to call later than listeners listening to the Station’s analog over-the-air signal. As a result, the odds of an online listener entering this Contest on-air may be diminished. Grand Prize. Ten (10) Grand Prizes will be awarded in this Contest. Each Grand Prize is one (1) pair of tickets (two tickets) for the Luke Bryant Sunset Repeat Tour at The Wharf Amphitheater in Orange Beach Alabama, 23101 Canal Rd, Orange Beach AL 36561. Five (5) pair awarded are valid for the concert on Friday, July 19, 2019, and five (5) pair awarded are valid for the concert on Saturday, July 20, 2019. ARV is approximately eighty dollars ($80). Winner is responsible for all taxes associated with prize receipt and/or use. Odds of winning the Grand Prize depend on a number of factors including the number of eligible entries received during the Contest Period and listeners participating at any given time.